Watch out: This book is addictively brilliant! Ian Tregillis' Something More Than Night is one of those books that manages to be both clever and exciting — you want to pause to admire all the brilliant ideas he's tossing around, but you have to keep turning pages to see how it'll turn out. This tale of angels is so brilliant, you might even forgive its nonsensical twist. The official description of Tregillis' novel sounds intriguing enough: a Raymond Chandler-style murder mystery set in Thomas Aquinas' version of Heaven. But the actual book is something quite a bit more ambitious, and a bit less pastichey, than that description implies. There is the Raymond Chandler aspect, but there's also a lot else going on. In Something More Than Night, the Angel Gabriel is murdered, and his burning remains are falling to Earth as the novel begins. 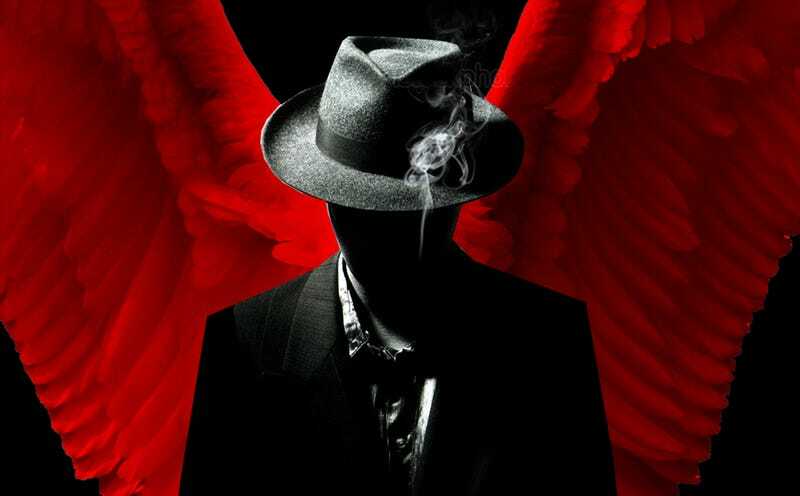 A low-level grifter angel named Bayliss is tasked with finding a quick replacement for Gabriel, to plug the hole in the firmament left by Gabriel's death. And that needs to be a human who's converted into an angel. So Bayliss goes to find a human who won't rock the boat when he joins the Heavenly Choir — but instead of the docile Martin, Bayliss accidentally gets Martin's troublesome sister, Molly. Soon Molly is getting mixed up in all sorts of trouble — including problems with whoever killed Gabriel. The dead angel was the guardian of the Jericho Trumpet, a device of unthinkable cosmic power, and now the Trumpet is missing and a bunch of Heaven's major players want to get their mitts on it. Meanwhile, there are other mysteries inside mysteries, all of them pointing to a strange conspiracy. The book is told from two viewpoints: Molly's straightforward third-person POV, as she adjusts to becoming an angel and dealing with the Pleroma, the plane where angels live outside of the mortal realm; and Bayliss' Chandleresque first person narration, in which Bayliss is a gumshoe who starts thinking of Molly as his client and uses old-timey slang to describe everything. Bayliss' parts of the narrative are entirely shaped like an old pulp detective novel, to the point where all of the cosmic events of the story are reshaped into a hard-luck story of a sad sack who's in over his head. The juxtaposition of the two kinds of narrative — Molly dealing with the anguish and dislocation of losing her humanity and becoming a strange immortal super-being, and Bayliss, getting knocked around by Cherubic bruisers and nabbed by the angelic cops — creates something that's thrilling as well as poignant. Both of these angels are out of their depth in ways that ratchet up the tension and create a nifty kind of suspense. Especially after Molly makes one or two crucial mistakes, and Bayliss gets himself into some brawls he can't win. What makes Something More Than Night more than just a noir parody crossed with a cool story of angelic politics is the amount of cleverness jam-packed into the world-building, which winds up crossing over with the intricate plotting in a nifty way. Without giving too much away, Tregillis has come up with a whole cosmology that has a lot in common with Aquinas but is also its own thing, complete with an origin of the universe and the nature of existence. Plus despite its fantasy trappings, Something More Than Night turns out to be very much rooted in science — Tregillis is a physicist, and he comes up with a strange science of angel existence, rooted in quantum chromodynamics and other ideas of particle physics. Some of the most dazzling leaps of prose come when Tregillis intermingles Bayliss' detective-novel slang or Molly's grounded perspective with the radical physics of the universe. In Tregillis' cosmology, angels existed before this universe, but were tethered to this mortal plane by something they call METATRON, or the voice of God. The proximity of so many angels intersecting in one plane creates the consensus view of reality that we humans take for granted, which they call the Mantle of Ontological Consistency, or MOC — so the only reason why the laws of physics work and are consistent is because of these angels. There's a lot more in the worldbuilding department, too. It's the near future, and there's been some kind of space war, and the atmosphere is full of deadly debris and humans can no longer go into space or deploy satellites. And the oceans have basically died off due to acidification and plankton death, and the whole planet is dying. The whole thing almost feels like it was written by Mike Carey, with an assist from Stephen Baxter, which is high praise. Alas, the book's final reveal seriously marred my otherwise stratospheric opinion of the novel, and I see it made a lot of other readers on Goodreads unhappy. I won't give away what this final twist is, only that it didn't entirely ruin the book or anything. I still love the clever worldbuilding and the characters — and the final twist, such as it is, does wind up making sense and illuminating the novel's themes. But it sits weirdly and leaves you wondering if Tregillis had written himself into a corner or something. Still, even with a somewhat disappointing final surprise, this is still one of my favorite books I've read lately and I still wound up being happy with the ending overall. Tregillis creates an ambitious tale of celestial conspiracy, with both huge ideas and an intimate scale, thanks to some really strong writing and some brilliant world-building. This is a book that will keep you reading late at night, and then leave you with really intense, weird dreams.